Last week, at precisely this time, my daughter and me had arrived at a sprawling campus tucked into the Western Ghats. The Mumbai Pune Expressway was a smooth drive and we passed chutney-green trees and baked-bread hills which looked lovely from a luxurious, air conditioned car. One lunch stop, one smack of boiling hot air, one hour of sweat and headache..and I knew that air conditioned cars were here to stay! The campus had imposing buildings and wide boulevards, but we were impressed by this group of enthusiastic college students who were organising the annual TEDx talks for their college. A generation younger to my children, a generation unnoticed in our hill town, a generation I had many a misgiving/misconception about. Second year students who had trawled the Net and news-channels for months, trying to find people who would be able to share something unique and interesting, who could translate into stimulating talks which would be heard, again and again, online. TED and TEDx Talks, an ocean of inspiration and fascinating insights, is the place to go for new ideas, old insights, fresh thought processes and latest inventions. It has been my go-to place for in-depth advice ( from how many towels do you need to procrastination and creativity in schools) . I love the format of an 18 minute talk, delivered without notes ( most of the time), while standing on a red circular carpet. The attentive audience picks up every cue for a laugh or a reaction, and yet, there is always the feeling that the speaker is speaking directly to me. Being a TED speaker, for me, seemed to be the ultimate accolade which one could receive in this world of attention deficit disorder! You can imagine how thrilled and terrified I felt, when MITWPU, Pune reached out to me and invited me to be a speaker in their event. What would I speak about? 18 minutes seemed like a life-time, but when I wrote down my thoughts about life, 18 hours would not have sufficed. I was cautioned about the Indian tendency to ramble along, I was given this link to a good TED talk, and finally, the book arrived too. Everything helped to shape and define the content for those 18 minutes. It was the idea which was important, not my experiences or life story. It took time, to get the words to flow, to learn the words and the pauses, and to modulate my voice. I practiced in front of the mirror/pine trees/ the dogs/kitchen counter. By the time we reached Pune, I had got the sequence right, but the best words would vanish, or fade into a dull sentence. It was panic time alright. That bright set of students put things in perspective. With the right combination of admiration, advice and reassurance, they explained the set-up and the routine for lights, sound, camera…they refused to believe that I could forget my talk…and they plied me with cold coffee and warm compliments. After the rehearsal, it was time to spend a quiet evening with a college friend, and the day ended well. The TEDx event was scheduled for Sunday afternoon. We reached a little early and got a chance to meet the other speakers..and what a spectrum of amazing people! From wildlife photographer Sagar Gosavi, to India’s cosplay champion, Sameer Bundela (confession– I had not even HEARD of cosplay), to a young and brilliant vlogger, MSK. A young mountaineer who left the mountains to climb the steep slopes of autism with her son, and went on to teach and train parents..A retired cosmology professor who has dissected the Rig Veda to find the physics and maths within. And then, I witnessed radium painting by engineering student, Ruturaj Vasant. It was mesmerising and spell binding, so here’s a link for you, to enjoy something similar. It was an evening of new experiences which opened the doors of my mind. Knitting, Dogs, Mountains–everything was pushed back while I listened to one talk after another, heard a young man sing into the microphone, and of course, that radium art performance. 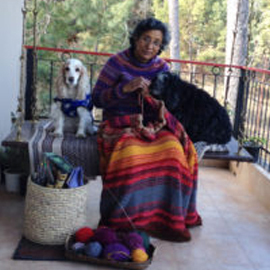 And while I watched the others, I knitted and kept my calm wrapped around me. The last speaker, me, finally ascended the podium at 5 pm. I stood on a small red circular carpet, looked at the three video cameras and lights focussed on me, switched on the microphone and began talking. In three minutes, I could see that mobile phone scrolling had stopped, that there were 180 pairs of eyes and ears focussed on me, and that I had connected with the audience. It was a humbling and unforgettable experience which will stay with me forever. 18 minutes glided past smoothly, and I came back to the present. Applause, admiration, adulation–it feels great! Especially from people who didn’t know me an hour ago. I must have been flying high, otherwise what made me slip my mobile into the bag next to mine, get into the cab to return to Mumbai, and then realise that I had lost my phone?! It took a couple of hours, one quick thinking and smart daughter, thirty TEDx volunteers and one patient cab driver to get the mobile back in my hands. By then, the euphoria had been replaced by exasperation at myself. I realised, yet one more time in life, that the Universe balances everything so perfectly. One little tilt, and I am back to normal! The link for the TEDx talks will take 6 weeks to emerge. I will remind you , my dear reader, at that point in time. Till then, I shall bask in remembered glory and keep that mobile close to me.